I spent the day in London yesterday, for a meeting with my publisher - Thames & Hudson - about the upcoming Cycle Chic book. It was a great meeting and we're muscling our way towards publication. The hardest part is choosing a short list of photos from the thousands and thousands in the Cycle Chic archives. I narrowed it down to 1300 photos from 26 cities. From there we have to cut it down even further but it's been great so far revisiting so many photos from the past four years - since that "Photo That Launched a Million Bicycles". I'm so looking forward to seeing 'the best of' in a lovely, printed volume. I am thrilled that there will soon be a Cycle Chic book! Please keep us informed about its progress. 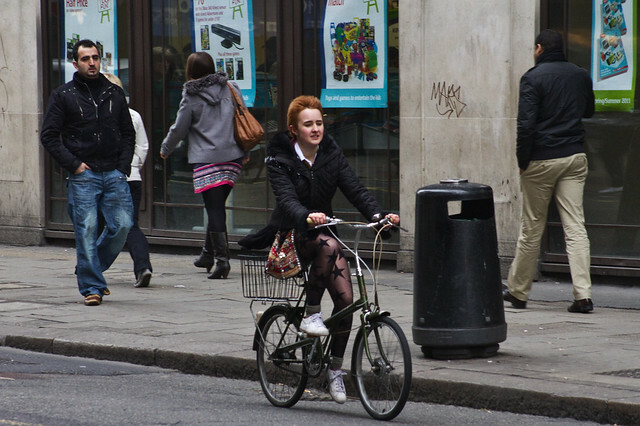 The gorgeous pictures on the Cycle Chic website keep me inspired as I ride my bike in a very bike unfriendly city. Cycle Chic is my morning dose of inspiration and seeing the wonderful pictures of citizen cyclists from around the world helps me ignore the rudeness and disbelieving looks I get as I cycle through my day. I can hardly wait to own a copy of this book!